The Majestic Theatre first opened in 1906 as a vaudeville theatre. Over the years everything from silent movies to the shows of Harry Houdini has graced this historic stage. There were even a few years where the theatre showed movies that featured the letter “X” rather prominently after the title. After a brief incarnation as a dance club, the Majestic Theatre has returned to its show business roots-this time as a live concert and performing arts venue. The idea behind the Majestic came from two music industry vets. One a musician, and one a booking agent. The musician would go on tour across the country and play in horrible venues, run by horrible people. He was regularly harassed for asking for water and was continually amazed at how there were “actually” only 150 people in a packed full venue that held 600. The agent would regularly receive calls from his clients demanding to know why they were booked in horrible venues run by horrible people. This musician and this agent happened to be friends transplanted from the midwest to the smoggy skies of Los Angeles. One night after a few too many drinks, they decided that they would become business partners and open up a concert venue that was great and run by great people who treated artists well and were honest. It was only after a good night of slumber that they realized that they would need to find an investor that realized their skill set, saw the vision and most importantly believed in the idea. Fast forward two years, three months, one week and one day and The Majestic Theatre held its Grand Opening. Today, downtown Madison is able to see, hear and drink to an eclectic mix of national talent several times each week, offering fans of every musical genre a reason to visit. 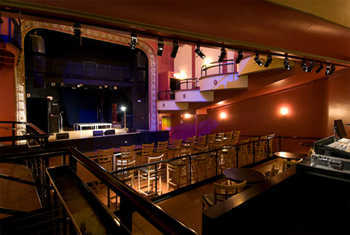 Beyond live music, the Majestic also features comedy, themed parties and “Brew n’View” movies. And who knows? We may even host an occasional burlesque show now and then to liven things up. The point is we hope to help turn our city into a more expressive and fulfilled cultural center as time goes by. As for or all you high-brow sophisticates out there, you should know our building is listed as a Wisconsin historic landmark and is featured on the Wisconsin Historical Society website at www.cinematreasures.org.